There are some sequels that can’t measure up to the potential of a good series. Blood Bound is not one of those sequels. In fact, I enjoyed it even more than the first installment in the Mercy Thompson books. A little backstory: Mery is a shapeshifter (a walker) who can transform herself into a coyote. She was raised by werewolves and is tight with their leader, Bran. She is living with Bran’s son, Samuel, who was her first love. Things ended badly between them years ago when she found out he only wanted her, so she could bear his kids. They only became reacquainted about 6 months ago, and now Sam is Mercy’s roommate… though he wants to be more. Adam is the local werewolf alpha and he lives next door to Mercy. And there is something between them.. but it hasn’t gone far. –Mercy is a mechanic by trade, and that explains her ties to Zee, the fae who used to be her boss, and Stefan, the vampire whose van she is working on. As our book begins, Stefan comes to Mercy to collect on a favor. There is a demon possessing vampire and Stefan believes Mercy will be immune to his mind control. He’s right, but the demon-vamp poses a much greater risk. He is crazed with bloodlust –and once everyone figures out his true nature, Stefan is tasked with bringing him down. Mercy’s wolf-friends get pulled into the search, which threatens their very lives. And of course, when all is said and done, they need Mercy to finish the job. This was a great book. I love the world-building in this series; And while Moon Called focused mainly on the wolf-world, this one gives us an inside look at the vampires. It’s heavy on the action and light on romance; but it’s very character driven. 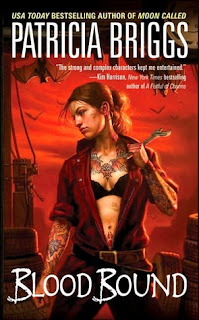 Would definitely recommend this series to any Urban Fantasy reader. 4 1/2 stars.